Dubai, UAE, February 08, 2018: When it comes to your true love, choosing the perfect gift is never easy. With Valentine’s Day around the corner, Mouawad brings you the most distinctive range of gifts to commemorate your eternal love with utter brilliance and romance. From the iconic Flower of Eternity designs, to the heart-shaped Rosette and Love M jewels, Mouawad offers a wide array of bejeweled hearts guaranteed to surprise and delight the person that matters most in your life. Flower of Eternity has quickly become a modern classic. Studied carefully, the flower emblem present in this signature collection by Mouawad reveals its composition of heart shapes. The heart, chosen as a universally recognized emblem of love and passion, appears three times, a symbolic number representing the past, the present, and the future, denoting a promise of eternal love. Rosette is a gorgeous line of contemporary and opulent jewelry that takes its inspiration from the fabulous rosette jewelry beloved in European fashion from the 14th to the 18th centuries. 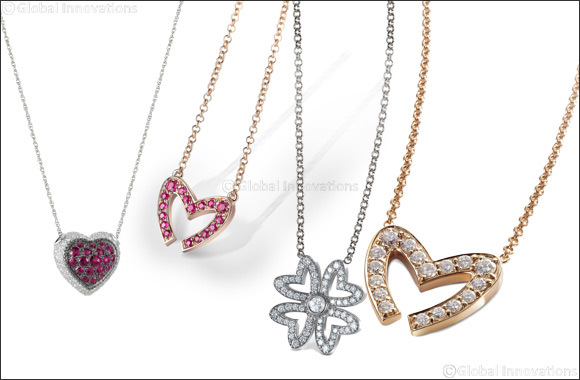 The collection’s name is inspired by the rose diamond shape that dominated gem cutting styles until the 18th century. Featuring precious diamonds and colored gemstones set in 18-karat white and rose gold, Rosette’s look is as eclectic as it is infinitely classic. Love M is an adorably fashionable gold and diamond collection, paying tribute to the eternal symbol of love and to the magic of love’s fleeting moments. Inspired by the M-heart motif that streams through Mouawad designs, the Love M collection gives a stylish interpretation to the cherished symbol of love with a glamorous line of 18-karat white and rose gold jewelry adorned with precious diamonds and rubies. Surprise your loved-one with the special gift of Mouawad Hearts this year, and make it a day she will forever remember.